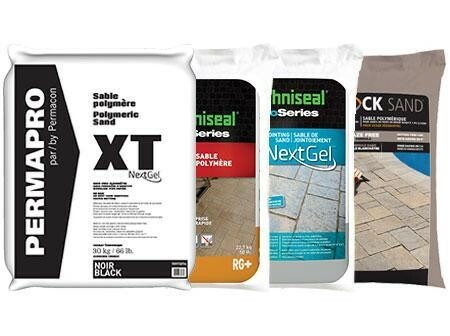 Polymeric Sand For Sale in Grimsby and Stoney Creek - Legends Landscape Supply Inc.
Polymeric sand is a unique material that can be used to strengthen the connections between your interlocking of flagstone project. It is a critical element in all of these projects, and should not be overlooked. It requires only a very small investment, and will be the key to increasing the longevity of your landscape. It will also prevent weeds growing up through the pavers and eliminate joint erosion. This material spread like normal sand, but once set with water, the individual parts bond to form a solid joint between patio stones and pavers. We have been asked constantly whether or not it really works, the reason being that newer homeowners have seen the problems their parents have had in the past with polymeric sand turning to mush. Luckily, over the past 4 years there have been amazing advancements in the manufacturing of this material. The "new" polymeric sands are now cement based products. These products are standing up to the test of time. They are made to expand/contract and re-heal. This means that when it rains the product becomes pliable. If you touch it after a heavy rain, it will be spongy to the touch. After it dries it becomes rock hard again. This feature eliminates soil entering cracks and allowing a place for weeds to grow. It also means that you can pressure wash at will and never blow your polymeric sand out of the joints. You will never have to worry like your parents had to. This product is reliable for a variety of applications, including flagstone and pavers used in poolsides, patios, driveways, and paths. It is available in beige and grey. It is available in regular strength and high performance options. Choose high performance for pools, driveways, and other high traffic areas. It is worth the increase in strength for the minimal 10 cent per square foot cost difference. Before installing polymeric sand to an old job, first remove all existing material with a pressure washer. It is important to remove old sand to the bottom of the paver for best results. For best results, compact (or tamp) smaller pavers with a vibrating plate, or a rubber hammer may suffice on smaller jobs. Compaction should not be used for pavers that are greater than 12 X 12 inches in size. Almost all 80 mm products are safe to tamp. Wet cast products should not be plate tamped. Wet cast means products poured into molds in a wet state; these are usually the more expensive products and the newer look products. Ask our team or your landscaper to be sure, as it is the last step of a landscape job and can be costly if all large slabs crack. Remember that compacting can sometimes damage the face of your paver. A trick is to use a 4 x 8 sheet of plywood to cover the pavers and preserve the face of the block. Professionals buy proper hard plastic attachments for their tampers to eliminate this problem. First, ensure that the surface is completely dry and there is no rain in the forecast, then sweep the sand in between the joints. Compacted, it should fall 1/8 of an inch below the paver surface-this is important so your interlock drains properly. Installation of poly sand to the top of paver will not allow for sufficient drainage, and there will be significant runoff from the hardscaped area which could be detrimental to the surrounding area. Remove all excess material from the surface using a leaf blower or broom. All signs of white dust should be removed before watering. Direct a mist of water into the air so it will land on an area of the surface for 15 seconds using a hose. Repeat for no more than a total of three times, until you see a very minimal amount of water retention in the joints. With textured pavers, it is recommended to blow off the pavers during the wetting process too. This should be done when pavers are still wet, to prevent a haze from forming. A Haze is much easier to prevent from proper install methods than it is to remove afterwards. You can purchase this product in 50 pound (22.7 kg) or 66 pound (30 kg) bags. The below chart should guide you in choosing the quantity that is right for your project. Stop by our showroom today for the most comprehensive selection of landscape supplies in Southern Ontario. Our knowledgeable team will help get you set up with the polymeric sand and interlock supplies that you need for your next landscape creation.